Bitlord is the PUP that uses misleading techniques to prevent removal. Use Reimage to locate malicious components and get rid of them faster than with uninstall instructions. A full system scan blocks virus reappearance and prevents traffic to malicious domains. 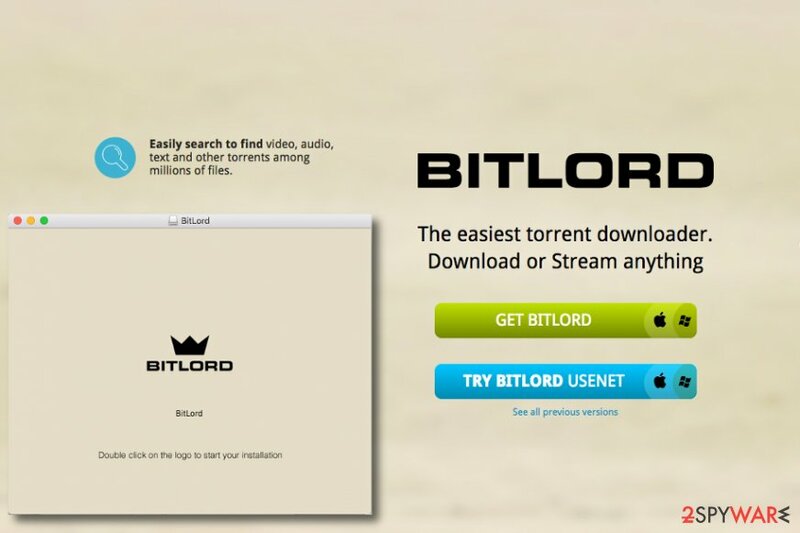 Bitlord claims to be “the easiest torrent downloader,” although in reality it is a potentially unwanted program, which can be included to 'adware' and 'browser hijacker' category. It seems that it has already initiated problems for many PC users that keep looking for a method that could help them remove this program from their computers. Once installed, the suspicious software installs BitLord Toolbar on the most popular browsers and changes default homepage to search.conduit.com. Previously, Bitlord used to be an open-source software, but later its developers officially made it a closed source (proprietary) software. The software received a lot of criticism from users claiming that open-source software is likely to be less suspicious as anybody can see the code. Some users have expressed complaints about a bunch of spyware programs appearing on the system right after installing BitLord. In March, 2012, authors of this potentially unwanted software decided to launch a version of Bitlord for Mac OS X. Since then, Windows users aren't the only ones concerned about the issues caused by this software. According to experts, Bitlord is mostly spread in a bundle with freeware and shareware, what explains why it has easily tricked thousands of PC users into installing it. As soon as it enter computers, this program affects all web browsers that are installed on the system and starts showing up everytime victims start browsing on the web. The said hijacker also alters homepage settings to promote a highly untrustworthy search tool known as Conduit Search. Cyber security experts have known this cyber threat for years as it always renews its activities and spreads with the help of different freeware. It works as a browser redirect virus that serves sponsored search results to the victim and likely triggers redirects to vague external sites. If your computer started to act suspicious after installation of the described torrent downloader, do not hesitate and remove BitLord virus instantly. Since this computer software is known to be promoting other spyware-type programs, we strongly recommend using an anti-malware software for its removal. If you do not have such software yet, think about programs like Reimage or Malwarebytes MalwarebytesCombo Cleaner. You can find their reviews on our website. 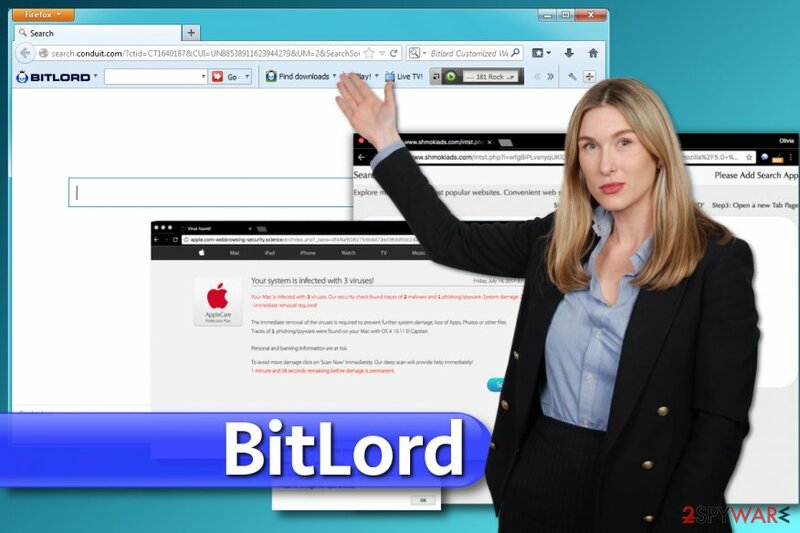 BitLord often adds its toolbar to victim's browsers and changes default search engine. In addition, annoying ads might start appearing on screen. In case you are determined to get rid of the suspicious virus manually and complete BitLord removal by wiping out all ad-supported programs at once, please read the guide we provided carefully. However, DieViren.de professionals still suggest performing a free system scan using anti-malware software afterwards to find out whether all of the questionable files were removed. Bitlord can be downloaded from the Internet just like any other application. However, it mostly gets inside its target PC systems in a bundle with freeware and shareware. If you found Bitlord Toolbar on your computer, it means that you agreed to install it when downloading other programs from the Internet. Beware that, no matter how trustworthy it looks, this program may start showing its commercial ads, initiate browser's redirections and track your browsing habits. This feature can easily lead you to the loss of your personal information and additional problems. That's why we don't recommend leaving Bitlord on your computer. Question: I was tricked into installing BitLord while browsing The Pirate Bay website. Now I can't uninstall this program from my Windows computer no matter what. What is the right way to eliminate this malicious software that displays ads for me? Answer: You can uninstall BitLord using uninstaller (Bitlord-uninst.exe) that stays in the program's folder. To access this folder, right-click on Bit Lord's shortcut on your desktop and choose Open File Location. Open the uninstaller and follow the steps displayed on your screen for a successful elimination of the potentially unwanted program. Alternatively, you can delete this software via Control Panel (see instructions provided below the article). Question. How to uninstall BitLord on Mac? I tried dragging it to Trash but all I get is a message saying “The item 'BitLord' cannot be moved to the Trash because it can't be deleted.” How am I supposed to delete this virus in a different way? Answer. Dear visitor, the first thing you want to do is to Force Quit BitLord app. Afterward, you will need to trace down a list of dangerous components associated with a DownLite trojan (Mac malware). You can find in-detail instructions how to fix your Mac below. You should always carefully check what applications you install on your computer (Windows or Mac). Reading user reviews online is always a good idea. Contrary to a popular belief, Macs are actually vulnerable to spyware/malware variants, so users of these computers should also stay vigilant when installing software from various third-party sources. If you noticed that Bitlord Toolbar affected your web browsers, you should waste no time and remove BitLord virus from the system. First of all, we recommend checking the system with updated anti-spyware and eliminating malicious files. This can be done with a help of Reimage, Malwarebytes MalwarebytesCombo Cleaner or any other reputable anti-spyware. As always, you can also attempt to perform a manual BitLord removal. We would like to remind you that this method is not as safe as the automatic one as you risk leaving some hazardous files on your system. To uninstall Bitlord Toolbar and other components related to the described malware, follow the provided guidelines. Here, look for Bitlord or any other recently installed suspicious programs. First of all, Force Quit BitLord and then access Applications folder to find and move the virus' icon to Trash. You should access a folder called VSearch. Drag the com.vsearch.agent.plist to Trash. Wait until you see Applications folder and look for Bitlord or any other suspicious programs on it. Now right click on every of such entries and select Move to Trash. When in the new window, check Delete personal settings and select Reset again to complete Bitlord removal. Once these steps are finished, Bitlord should be removed from your Microsoft Edge browser. Here, select Bitlord and other questionable plugins. Click Remove to delete these entries. Now you will see Reset Firefox to its default state message with Reset Firefox button. Click this button for several times and complete Bitlord removal. Here, select Bitlord and other malicious plugins and select trash icon to delete these entries. Click Reset to confirm this action and complete Bitlord removal. Clean Safari from questionable extensions such as Bitlord Toolbar, Spigot, Conduit, or the like. Here, select Extensions and look for Bitlord or other suspicious entries. Click on the Uninstall button to get rid each of them. Here, look at the Homepage field. If it was altered by Bitlord, remove unwanted link and enter the one that you want to use for your searches. Remember to include the "http://" before typing in the address of the page. Now you will see a detailed dialog window filled with reset options. All of those options are usually checked, but you can specify which of them you want to reset. Click the Reset button to complete Bitlord removal process. ^ BitLord. Wikipedia. The Free Encyclopedia. ^ Reddit topic: Do not download BitLord. Reddit. American Social News Aggregation, Web Content Rating, and Discussion Website. ^ DieViren. DieViren. Malware Removal Guidelines. This entry was posted on 2017-09-13 at 07:31 and is filed under Stealing programs, Viruses. You can quickly scan the QR code with your mobile device and have Bitlord manual removal instructions right in your pocket. 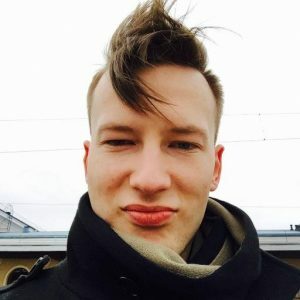 How did you remove Bitlord?